I must give credit for this refreshing, light yet sharp dessert to the chefs at Sushi Yoshida. I back-engineered this from a dessert I like very much there. I don't have a picture of the finished product, it was slurped up so quickly I didn't get a chance to take a picture but it is definitely a pretty, neat and sophisticated dessert. Core the yuzu and slice up the skin, peeling back half the pith and fibre that is attached to the skin. Soak these slices of skin in a good quality, clean tasting honey and add the yuzu juice to the mixture. You can also do this with some oranges and for an added sharpness and colour, grapefruit. Finely dice mint leaves and shiso leaves and mix them into the yuzu and honey for taste and the lovely green bits. You don't want the taste of the leaves to be overpowering, just subtle and refreshing. Chill the mixture and slice up aloe vera in diced strips. Serve the yuzu and aloe mixture spooned over a scoop of ice cream, or neat on a shiso leaf. Warning, without the smoothness of the ice cream, this can be an tangy, acquired taste, especially for non-fruit or non-Japanese taste audiences. You could make the dessert really gratifying and de-seed Japanese champagne grapes and soak those in the dessert so that the grapes can just be eaten as a whole turgid but soft explosion of sweet, slightly jellied, clear grape juice. But then, that'd just be spoiling them. I am so pleased with myself. I have successfully made a wobbly panna cotta. Just firm on the surface but creamy liquid smooth on the inside. Sort of on the cusp of soft but supple milk bubble-perfection. This is usually Colin's forte so I never try making it myself but he's not coming back for half a year! I love to have this with fresh fruit puree or fresh berries, it's one of the lightest and ephemeral desserts I can think of. Check out the recipe we posted before here and try it for yourself, it's literally a 10 minute preparation and can be made a day beforehand! In a large bowl, sift together flour and cocoa powder. Set aside. In a small bowl, using a fork, combine remaining ingredients; add to cocoa mixture. Rub mixture with your fingers until it holds together without large clumps of butter remaining. Turn mixture onto a clean surface, and knead until smooth, about 1 minute. Form into a disk, and wrap in plastic; chill 30 minutes. Preheat oven to 170C. Roll out or press dough into tart pans and prick holes in bottom of the pastry with a fork. Bake for 20 minutes, until golden brown around the edges. Remove and allow to cool completely. This recipe makes about 5 small tart pans or 1 10-inch tart pan. Beat egg yolks with sugar till light and fluffy, add lemon juice and zest. Set the bowl over a steaming water bath and mix till eggs and lemon thicken. Add the butter to the mixture when it has thickened. Let cool and add in half a cup of whipped cream. Both the lemon filling and the chocolate tart should be cool when assembled. Refrigerate and decorate with raspberries or lemon curls. I'm actually not a huge fan of this lemon curd recipe, which makes a very sharp and strong lemon curd. You can also use these other recipe that I put up recently here for lemon cream, which is smoother, more lucious and yummier. Another variation is to put the lemon curd at the bottom of the tart and fill the top with a chocolate ganache, which can be decorated with a design on white chocolate on the surface. When the cream is at the boil, remove the pan from the heat and, working with a whisk, gently stir the cream into the chocolate. Stir until chocolate is completely melted and mixture is smooth. Leave the bowl on the counter for a minute before adding the butter. Add 3/4 of the butter to the chocolate bit by bit, stirring gently to blend. When the butter is fully incorporated, the ganache should be smooth and glossy. Refrigerate ganache until chilled. Remove ganache from fridge and empty into bowl of electric mixer - whip until light and fluffy. Pour whipped ganache into tart shell, smooth out with an off-set spatula and refrigerate until set. Heat the 1/4 cream carefully, add to the 1/4 remaining chocolate and mix in the 1/4 remaining butter as before. Let cool for a few minutes on the counter. Pour over chilled ganache in tart shell and leave on counter while preparing the white chocolate. The idea behind this is that by the top layer of the chocolate ganache needs to be wet, so that you can dredge through the white chocolate with a toothpick for making designs. Melt white chocolate on low heat. Allow to cool on counter for 1-3 minutes. Pour into small sealable bag or cake decorating bag with small tip and pipe swirls on top of still pliable ganache icing on tart. Take a skewer and drag it through the white chocolate and top layer of ganache to create a design. Dad strikes again, he is on a roll. I join him and Colin for lunch at his newest find, a quaint french bistro called Picotin. The restaurant is accesible from Turf City Road, near the Eng Neo turnoff to the Pan Island Expressway and the entrance is marked by a jaunty lit balloon. The actual turning into the restaurant is quite squeezy (I came within inches of a lovely Ferrari parked on the side, yikes!) and the owners have vowed to get two valets for the convenience of guests. Picotin is a collection of stables that have been rejuvenated by Sebastien of Greenwood's Sebastien. I believe this is a joint venture with Emmanuel Stroobant from Saint Pierre who runs the store appending the restaurant, selling breads, gourmet goods and deli foodstuffs from his brand Archangel. The style is french modern and the kitsch factor is red napkins, high polished wood tables, a pizza grill and horse-themed menu items. Oh yes and the two additional points for being within a near radius to my house. This is their pizza grill, which I believe is actually not a wood fire but with an interesting contraption that trickles a roaring flame out from the sides of the oven, heating the clay floor and sides. They also have a sizeable outdoor seating area that's at least as big as the indoor part and they were elaborating plans to push back the verendah at the back to create a better garden vista and more parking space. This was the duck salad starter I had. I would have preferred a lush flaky pastry basket and the filo was a bit...hard but the duck meat was tender and soft and made a good contrast to the citrusy salad. We also had a lobster bisque which wasn't steaming hot, which caused it to be a bit fishy and rather thin in flavour. It was also pretty unsubstantial for $16. Colin had the lamb tagine, which was good but much weaker than the proper Moroccon ones that he's experienced before. It came served with a bowl of cous cous. We shared two pizzas, a ham and cheese and a meat pizza. While maybe not the best I've ever eaten, they were pretty good and I liked how the crust was thin but not too cracker-like and the flavour was very strong. Good cheese too and piping hot when it comes out of the oven. My recommendation would also be for the meat pizzas though you might like to try the vegetarian options, like the palomino version which had artichokes, olives, mushrooms and tomatoes. On seperate occasions, we went back and tried their duck confit (not dry nor crispy enough) and their beef short rib (excellent, with a giant bone poking out of the soft braised meat). The atmosphere is very convival and yet not unbearably noisy, such that even our mature guests had a good time, although they did complain about the discomfort of the high seats. The desserts are the usual creme brulees and tarte tartins but the one standout is really their profiteroles, which are generously stacked with vanilla ice cream. My dad's favourite dessert I now think is profiteroles, so I've tried, oh every one at every restaurant in Singapore I imagine. By comparison, these are ice cream profiteroles, not angelica cream profiteroles like those at Cicada (though those were good too) and they are similar to the ones at PS Cafe, except supersized and they are both better than the chocolate sauce-drowned little balls at Au Petit Salut. Go have a hangout at this cute little manger! It's not cheap though and more a fun drinks and pizza place than a location for a romantic dinner. You should expect to pay about $19 for a pizza and $28 for a meat main. Desserts are about $8. The day after Christmas, my dad came up with an edict that we were all going out for lunch. Where? We asked. This place I found, he replied. Curious and to be honest, somewhat sceptical, my brother and I got dressed and trotted out to Cluny Court, where the place my dad had read about was Karma Kettle and Rhapsody, a little British-Indian styled cafe tucked in the bottom of a shophouse along the Cluny cluster, a few doors down from Awfully Chocolate and Cold Storage. The set-up is cute, picnic tables sit outside the white cottage windows and the interior is decorated with wall sketches and paintings reminiscent of the old English Enid Blyton storybooks and hand-painted signs touting the goodness of tea. First off, I must say that Boxing Day is a rather abysmal time to be visiting any restaurant as you're invaribly served a mish-mesh of leftover turkey meat by curt waiters. That being said, I was charmed by this place, their friendly entreprenuerial owners from Darjeeling and their helpful if slightly inexperienced Nepalese staff. The young couple, Dhiraj Arora and his wife Preeti, have a background in hospitality and have set up shop in Singapore with this little cafe and also a large establishment in Dempsey (the Dempsey outlet has just European food). They are very brave. I'm not sure the casual cafe segment is where I would choose to set up in Singapore, especially in Indian food, given that you often get sandwiched between the food centers and the more upscale ambience eateries. There is also an associated shop nearby where they purport to sell gourmet items which have struck them on their travels and overseas adventures. Colin had a pumpkin soup, which while a little watery, had a good spicey taste to it. He also had a lamb Rojan Josh of sorts. My mom had a Chicken Tikka Masala and I had a Vegetable Curry. I really enjoyed these dishes. The cooking was light and deft and the freshness of the vegetarian meal revived me after the heavy eating of the Christmas season. My dad, to the surprise of all, ordered the English Lavender Chicken ($15.50) served with herb rice and asparagus, primarily because he didn't like the idea that any of us should order the same thing. The idea of lavender with savoury chicken sounds a bit like mixing English soap with meat but these pan-fried and herb-reduced chicken breasts were tender and juicy. I must say that the taste of the generously studded lavender sauce is still quite unintuitive but it is unique and rather enjoyable, with the relatively coarse grains of herb rice. For dessert, we had the mince pie and chai lattes. Their chai is a bit milky weak but the spice content is incredibly strong! The mince pie was sadly, really very small for its price. Their signature dessert, the only one that's really listed on the menu, is the Eton Mess features a sweet combination of strawberries, meringue, vanilla sponge and marmalade but it sounded overpoweringly sweet for my mom. The bill for four people, on a very light, one-dish lunch, came up to more than $100 and this is probably the problem with the premise of this restaurant. I liked it and I wish the owners nothing but the best, but how many people in Singapore are going to come and pay $17 for a small plate of vegetable curry rice? Or $8 for little bowls of soup or small mince pies? It just isn't value-for-money, in a food society that is very value, or else status concious. I also didn't really like the idea of sitting by the noise pollution of bukit timah road (which from my travels in India I know is much more acceptable than it is here), nor the kitschy decorations. though I thought the food pretty palatable, if pricey. Milk-fed veal ribs ordered from Indoguna, waiting to be grilled after being seared and basted with mustard. The fish were at least a couple kgs heavier than last year, in fact they were so large, they were hard to roast, which we did, in the oven, with a saffron-infused white wine, lots of herbs like majoram and sage, garlic and served with some wilted cilantro. Our dinner spread...that beef was good-o! I made a vegetable pasta with artichokes, pumpkin pieces, sun dried tomato, olives, cheese, pesto and heaped with cherry tomatoes to go with all the meat. Cooking up apples in caramel for the tarte tatin. Dessert table with lots of fruit and Colin's panna cotta. 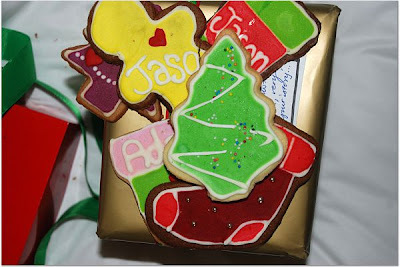 Just for good measure, lots of personalized Christmas cookies and good cheer!